Why Do Americans Use Social Media? These days, “66%, two-thirds of online adults, use social media platforms such as Facebook, Twitter, MySpace or LinkedIn,” states the latest PEW Research report. And while we are thinking about how we can leverage social media at academic institutions to support research, for example to foster internal communication and knowledge sharing, the report adds numbers to some of the known reasons that motivate people to use social media. (The 66%) say that connections with family members and friends (both new and old) are a primary consideration in their adoption of social media tools. 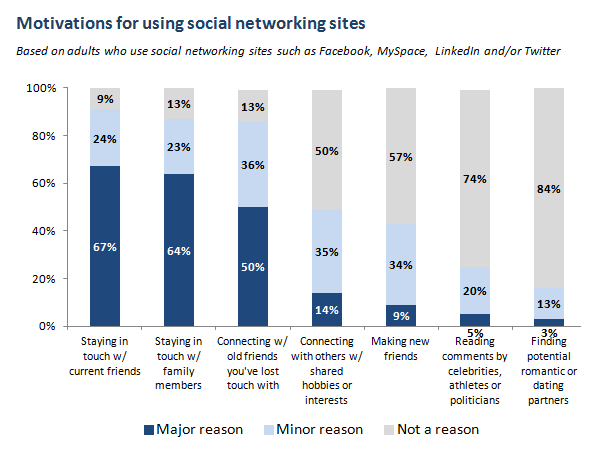 Roughly two thirds of social media users say that staying in touch with current friends and family members is a major reason they use these sites, while half say that connecting with old friends they’ve lost touch with is a major reason behind their use of these technologies. Other factors play a much smaller role: 14% of users say that connecting around a shared hobby or interest is a major reason they use social media and 9% say that making new friends is equally important. Reading comments by public figures and finding potential romantic partners are cited as major factors by just 5% and 3% of social media users, respectively. See the full report for more details, including differences among age and ethnic groups when it comes to what they value most in social media. ← Revamping Education: Where Are We Going With Online Learning?